The week flew by before I knew it. And what a week. The historic US election, my dad’s fleeting visit to London and a dinner for my colleagues all crammed into five days of euphoric mayhem. The dinner was planned months in advance. But the US election sweepstake sent a buzz through the office. Spirits were running high. And so were dinner expectations. Great. Now I’m being confused for Buckingham Balti. I threatened them with the local Indian takeaway and secretly panicked. This is a big mistake. I am setting myself up for a fall. My professional image is under the microscope. What if I can’t churn out a meal for the troops like the endless papers I produce? I decided to match the moment with a fiery meal, planned to ignite their senses. The dinner of Bhuna Gosht, Achari Baingan, Anda Raita, Lasuni Dal Palak and Bhapa Doi went down almost as well as Obama’s victory. This recipe is from One Hot Stove. 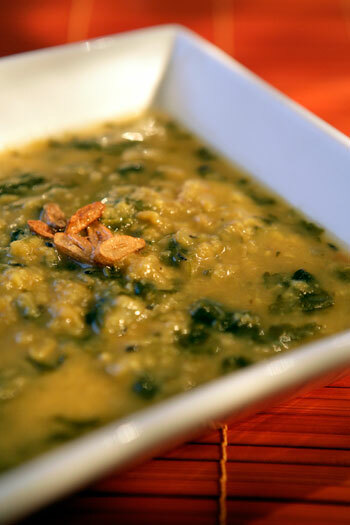 Lasuni Dal Palak, or garlicky spinach lentils. Stupendously easy and bursting with flavour, it was the perfect accompaniment for a high-octane evening. Wash the lentils thoroughly and set to boil with twice as much cold water ad the turmeric powder in a medium pot. Chop finely or garlic press four garlic cloves and slice the onion and tomato. In another small pot, bring the oil to heat over a high flame. When it’s hot, add in the cumin and garlic. As they sizzle up, stir in the tomato and onion and fry for tw minutes on high until they are soft. Next add in the spinach, lower the flame to a medium and cook the spinach until defrosted or wilted. Keep an eye on the lentils and if they are drying up add a bit of hot water to them. To keep the dal thick, don’t add too much water, just a little bit every time the lentils start spluttering because they’re too dry. When the lentils incorporate with the water and get a soup-like consistency and texture, mix in the spinach. Add a little hot water to combine all the ingredients and keep it bubbling to infuse flavours. After five minutes, fire up a small pot with the ghee and slice the remaining two garlic cloves. When the ghee is hot, add the sliced garlic and chilli powder. As the garlic starts turning golden brown, mix this tadka into the main pot of dal. Finally check for salt and serve with a squirt of lemon and some hot Basmati rice. 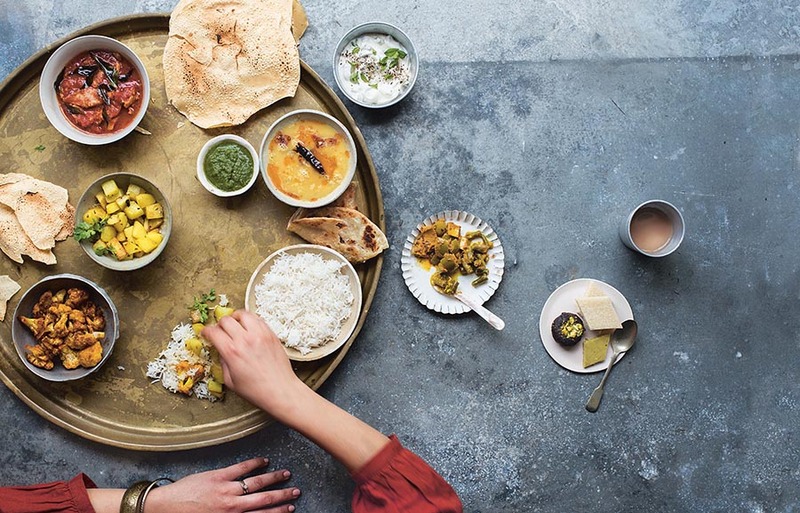 Nice blog…I like your style of cooking…Between work and school and a grown-up baby (aka the husband) to take care of, I have very little time for my first love..discovering/inventing good and healthy indian food. I generally do not cook anything if it takes more than 30 mins over the week (cleaning up included). Like you I rely on easily available stuff and some prep work completed over a bollywood DVD on Sunday afternoons. I have a question here for everybody – do you re-use oil after frying something? Asking because if I do have to fry stuff, I do not know what to do with the remaining oil and its a shame to waste so much. And in response to Sonia, I don’t know what to do w/ excess oil, unfortunately. I am under the impression that you can reuse it, but am not sure about that. This reminds me a bit of your delicious Punjabi dal, which has become one of my quick go-to meals. Lovely recipe, Mallika! and it also looks easy, healthy and so flavorful. Can’t wait to try it! fabulous looking dal – yellow dals are my favorite! If you have time to fit it in I would love your recipe for Bhuna Gosht as this is one of my husbands favourites when we eat out. I was recommended this web site by way of my cousin. I’m not sure whether or not this publish is written by him as no one else recognise such unique about my problem. You’re amazing! Thanks! Oh… please ignore my question! Reading you other recipes, I understand gm = grams here!